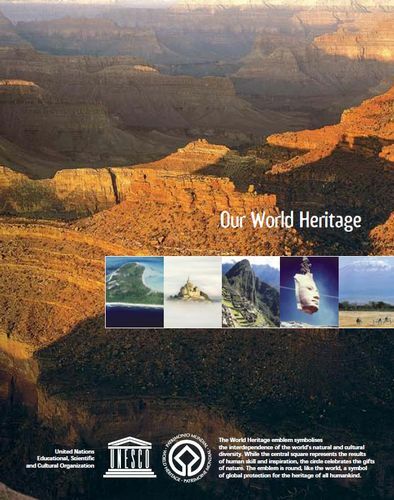 UNESCO's World Heritage brochure: Not as naive as it seems. UNESCO never bothered to condemn destruction of Temple Mount artifacts by the Wakf - the Palestinian religious establishment - which was a grave breach of the very international laws related to antiquities and sacred sites that UNESCO is charter bound to protect. Similarly, UNESCO never condemned Palestinian desecration of Rachel�s Tomb, of Joesph�s Tomb or of any of the ancient synagogues in Gaza and Jericho which they razed to the ground. They decided to abandon the peace process and seek international recognition of the �State of Palestine� � a state in a de facto state of war with Israel. And they are pursuing their goal relentlessly. Recently their efforts bore their first fruit with the UN�s Educational, Scientific and Cultural Organization�s (UNESCO) vote to accept �Palestine� as a full state member. It is not a coincidence that the PLO/PA decided to apply for membership for �Palestine� at UNESCO first. Ever since 1974, UNESCO has been an enthusiastic partner in the Palestinians� bid to erase the Jewish history, heritage and culture in the Jewish Land of Israel from the historical record. Beginning in 1996, the Arab Wakf on the Temple Mount began systematically destroying artifacts of the Second Temple. The destruction was undertaken during illegal excavations under the Temple Mount carried out to construct an illegal, unlicensed mosque at Solomon�s Stables. UNESCO never bothered to condemn this act. It was silent despite the fact that the Wakf�s actions constituted a grave breach of the very international laws related to antiquities and sacred sites that UNESCO is charter bound to protect. Similarly, UNESCO never condemned Palestinian desecration of Rachel�s Tomb, of Joesph�s Tomb or of any of the ancient synagogues in Gaza and Jericho which they razed to the ground. In 2010, it designated Rachel�s Tomb and the Cave of the Patriarchs in Hebron as �Muslim mosques.� UNESCO�s campaign against Jewish history is not limited to Israel. In 1995, it passed a resolution marking the 50th anniversary of the end of World War II. Despite requests from Israel, the resolution made no mention of the Holocaust. In light of UNESCO�s virulently anti-Jewish policies and actions, it is not surprising that it cooperated with the PLO/PA�s bid to achieve recognition of a state that is in a state of war with Israel. More surprising than UNESCO�s behavior was the behavior of all but five EU member states. Aside from the Czech Republic, Germany, Lithuania, the Netherlands and Sweden, all EU member states either voted in favor of the Palestinian membership application or abstained. UNESCO was weakened by the vote for two reasons. First, since US law bars the government from funding UN agencies that accept �Palestine� as a member nation outside the framework of a negotiated peace with Israel, in accepting �Palestine� UNESCO reduced its budget by the 22 percent covered by US contributions. Second, by accepting the Palestinians as a member state, UNESCO undermined its legitimacy and organizational viability. Accepting �Palestine� represents a breach of the organization�s charter. The charter stipulates that only states can be accepted as members. Moreover, it represents a repudiation of the goals of UNESCO as laid out in its charter. Those goals involve among other things promoting cooperation in education and advancing the rule of law. As a recent report by the Institute for Monitoring Peace and Cultural Tolerance in School Education (IMPACT-SE) showed, PA textbooks remain imbued with Jew-hatred at all education levels. By enabling this breach of the UNESCO charter, the Europeans made a mockery of UN rules and so weakened not just UNESCO but the UN system as a whole. The Europeans� claim to support the cause of peace between Israel and the Palestinians was rendered hollow by their behavior at UNESCO. The peace process between Israel and the PLO/PA is predicated on the latter�s commitment that a Palestinian state can arise only as a consequence of a peace treaty with Israel. By supporting the Palestinians� breach of this fundamental commitment at UNESCO, the Europeans diminished the possibility of achieving a negotiated peace that will lead to Palestinian statehood. What the Europeans� behavior at UNESCO indicates is that just as UNESCO is willing to undermine its mission to harm Israel, so the Europeans are willing to undermine the declared goals of their foreign policy if doing so will harm Israel. This state of affairs has important consequences for Israel. To date, Israel has placed fostering good relations with EU member states high on its list of priorities. In light of the Europeans� behavior at UNESCO, this ranking should be revised. The Europeans do not merit such high consideration by Israel. Finally, the UNESCO vote exposed disturbing truths about US President Barack Obama�s position on Israel. Obama has been widely praised by American Jewish leaders as well as by Prime Minister Binyamin Netanyahu for his announced commitment to veto the draft Security Council resolution recommending that the PLO/PA be granted full state membership at the UN. Obama�s pledge � forced out of him by massive congressional pressure � is touted as proof of his commitment to the US alliance with Israel. But Obama�s response to the PLO/PA�s bid for UNESCO membership tells a different story. In the lead up to the vote, the Obama administration went out of its way not to threaten UNESCO. It did not threaten to withdraw the US from the organization. Instead, just days before the vote, US Under Secretary of Education Martha Kanter addressed the body and praised the �great things [that] have happened at UNESCO,� over the past year. Kanter then announced the US�s bid for reelection to UNESCO�s executive board. So after UNESCO thumbed its nose at the US, undermined its mission, breached its own charter and seriously diminished chances of Palestinian peace with Israel by accepting �Palestine� as a member state, the Obama administration reacted with near groveling apologetics. To understand the full significance of the administration�s behavior, it is important to contrast it with the administration�s response to the Israeli government�s decision in the aftermath of the UNESCO vote to approve the construction of housing for Jews in Jerusalem, Ma�aleh Adumim and Efrat. All of the housing units will be built in areas that will remain part of Israel even after a peace deal. And the administration knows this. But speaking of the government�s decision, a US official told Reuters that the administration is �deeply disappointed by the announcement. So on the one hand, the Palestinians� move to abandon the peace process and UNESCO�s support for their move is merely �regrettable� and �premature.� But on the other hand, Israel�s decision not to discriminate against Jewish property rights undermines efforts to resume peace talks and harm prospects for an agreement. Since entering office, Netanyahu has repeatedly characterized Arab and leftist efforts to delegitimize Israel as �a strategic threat� to the state. In truth, he overstates the danger. Delegitimization is a political threat, not a strategic threat. Israel will not be destroyed by the UN or by professors at Oxford and Columbia or by trade unions in Norway. Since September 2009, citing the need to demonstrate the dishonesty of the delegitimizers� accusations against Israel, Netanyahu abandoned his lifelong opposition to a Palestinian state. He believed that Israel had to embrace the PLO/PA as a legitimate partner for peace in order to prove to the likes of Obama and his supporters that Israel has a right to exist. In the meantime, and in the face of Netanyahu�s staggering concession, the PLO/PA abandoned the peace talks and escalated its political war to criminalize Israel and delegitimate it. UNESCO�s acceptance of �Palestine� demonstrates that Netanyahu�s chosen policy is misguided. By accepting the legitimacy of the Palestinian demand for statehood, Netanyahu indirectly conceded Israel�s rights to Judea and Samaria and at a minimum placed its right to sole sovereignty over Jerusalem in question. In so doing, Israel gave the Palestinians� supporters at the UN, in Europe and at the White House no reason to reconsider their anti-Israel bias. With the Palestinians relentlessly asserting their rights, and Israel conceding its rights, why should anyone side with Israel? In the end, the only way to defeat those who delegitimize Israel and deny our rights to our historic homeland, our nationhood and our history is to expose their corruption, and their malevolent, dishonest and hateful intentions towards the Jewish people and the Jewish state. That is, the only way to defeat the delegitimizers of our ownership of our land is to delegitimize them by proudly and consistently asserting Israel�s historic and legal rights and the justice of our cause.